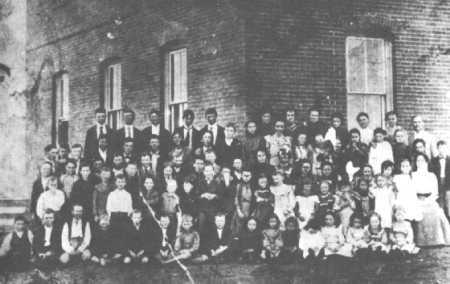 All of the students in Odessa between 1900 and 1903. Completed in 1899, this is the first brick school building in Odessa. George Hogg donated the land at 6th and Texas for the building which cost tax payers $2,750.00. It was never very sturdy and whenever the wind blew hard, the whole building swayed which is probably why it was only used for 10 years before another school build was constructed. Courtesy, Permian Historical Society Archival Collection. The Heritage Of Odessa Foundation, Anne Sherburn.